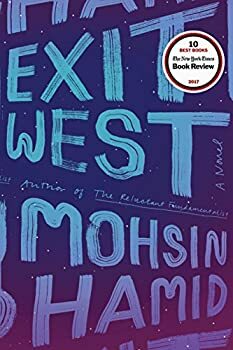 2017’s Exit West by Mohsin Hamid is definitely not speculative fiction. It is general fiction, literary in nature, which uses a trope of speculative fiction as one way to explore the nature of war, love and human migration. There is always a risk when a general fiction writer “discovers” speculative fiction and tries to write it without having read within the genre. The story often contains hackneyed, tired-out elements which the writer trumpets as new and amazing. Hamid dodges this risk completely. His strange black rectangles, which appear in doorways, like in closets or storage sheds, and lead to other parts of the world, are not explained. Even though they lead to mass migrations, they are a minor part of the story. Exit West focuses on the impact of migration on nations, communities, and individuals, in particular two named individuals, Nadia and Saeed. Nadia and Saeed meet in an unnamed eastern city that is experiencing civil unrest (which is rapidly escalating into war). They are attracted to each other, even though they are very different. Saeed lives happily with his mother and father and is devout. Nadia has rebelled against her family, lives independently and is agnostic or perhaps even an atheist, even though she wears long black robes that cover her body. She wears these not because she is devout but because they protect her, an unaccompanied woman, as she moves about the city. Interspersed with the beginning of their slow courtship are vignettes from other parts of the world. In Tokyo a bemused Yakuza soldier watches as two Filipina women come out of a bar’s storage room. In one scene that is emblematic for me, a man creeps out of the closet of a sleeping woman’s bedroom. He touches nothing, he takes nothing, he merely climbs out her window and leaves. As Nadia and Saeed grow closer, so does the war between militants and the government, and life in the city becomes more difficult and more dangerous. Parts of the city are held by the government, parts by the militants, and the borders of those areas are the most dangerous places. Saeed’s mother is killed by a stray bullet; Nadia agrees to move in with him and his father for protection, as things get worse and worse. Finally, the two lovers reluctantly agree to leave through one of the portals. Nobody in Exit West, except the two lovers, is named. Characters like Saeed’s parents are well-realized but they are called “Saeed’s father,” or “the woman at the grocery.” This goes a long way to creating the sense that these people could be any people. It could be anyone’s dentist who disappears, anyone’s mother who is killed while she searches for a stray earring in the family car. As Nadia and Saeed begin to move, going first to Mykonos, Greece, then to London, England, and ultimately to Marin County, California in the USA, the other migrants they meet are people, regular people. Before they leave their home city, we learn that the militants are using the portals to smuggle in fighters; when our main characters are in London, we learn that those same military extremists are sending fighters through the portals into cities like London to kill, in the hopes that they will turn the local residents against the refugees. While in London, the migrants face threats from nativists, riots and government intervention. In a sequence that mirrors the divided nature of the original city, the government turns off the electricity in the neighborhoods that are filled with migrants, creating a patchwork of light and dark, warmth and cold, poverty and comfort. Hamid plays fair; the portals seem to always appear within an existing door, so, for instance, the portal to London opens inside a forty-room mansion that is soon filled with strangers from all over the world. People are literally coming into homes. As their trek continues, we see the original characteristics of Saeed and Nadia playing out and beginning to splinter their relationship. Saeed longs for his home and seeks out people from his land and city, especially prayer groups, while Nadia approaches strangers, finding herself part of a more global community. Exit West has an artistic resolution, not a technological or plot-driven one. HIGHLIGHT HERE TO READ A SPOILER: It seems, at the end, that some nations have found ways to accommodate the migrants and use of the portals has reached an equilibrium of some sort. The final chapters show us Saeed and Nadia several decades on, in a familiar place, meeting for coffee. In an interview on PBS News Hour, Hamid said that he considers that many of us carry around black rectangles that can take us anywhere in the world, and he means our smart phones. It’s no accident that Nadia and Saeed plan all their early assignations by cellphone and nearly lose each other early in the book when electricity and connectivity fail in their home city. This is why the image of the sleeping woman with the stranger walking through her bedroom was so moving to me; it’s the internet. We invite people and their stories into our rooms and our most intimate spaces. Many of them are just regular people. Some of them are dangerous. Some of them need our help. The difference between a five-star book and a four-and-a-half star book for me can often be tiny. Hamid uses a particular prose style that includes long sentences, often paragraph length. He does this very well, and for most of Exit West it created for me the narrative voice of a storyteller. It did, however, get monotonous in one or two places. And for a story that is blunt about physical shame when residents of the home city must empty their bowels in slit trenches dug in the back yard, it never once mentions what Nadia does for supplies when she is menstruating, even though we are in her point of view nearly half the time. These are tiny points in an excellent book, but I couldn’t help noticing them. Published March 2017. NAMED ONE OF THE 10 BEST BOOKS OF THE YEAR BY THE NEW YORK TIMES BOOK REVIEW, SAN FRANCISCO CHRONICLE, PEOPLE, AND ENTERTAINMENT WEEKLY. NAMED A BEST BOOK OF THE YEAR BY TIME, GQ, O THE OPRAH MAGAZINE, AND LA TIMES. FINALIST FOR THE 2017 MAN BOOKER PRIZE. FINALIST FOR THE NATIONAL BOOK CRITICS CIRCLE AWARDS. A New York Times bestseller, the astonishingly visionary love story that imagines the forces that drive ordinary people from their homes into the uncertain embrace of new lands. In a country teetering on the brink of civil war, two young people meet—sensual, fiercely independent Nadia and gentle, restrained Saeed. They embark on a furtive love affair, and are soon cloistered in a premature intimacy by the unrest roiling their city. When it explodes, turning familiar streets into a patchwork of checkpoints and bomb blasts, they begin to hear whispers about doors—doors that can whisk people far away, if perilously and for a price. As the violence escalates, Nadia and Saeed decide that they no longer have a choice. Leaving their homeland and their old lives behind, they find a door and step through. . . . Exit West follows these remarkable characters as they emerge into an alien and uncertain future, struggling to hold on to each other, to their past, to the very sense of who they are. Profoundly intimate and powerfully inventive, it tells an unforgettable story of love, loyalty, and courage that is both completely of our time and for all time. Marion, with all due respect, the intro to this review is some of the most blinkered commentary I’ve read in a while. Contrary to the push towards openness and inclusion happening in (some pockets of) culture, your commentary builds a wall: us and them. We who know what genre is and those who don’t, i.e. those outsiders who would seek (and almost always) fail to use OUR tropes for THEIR benefit. It’s petty. 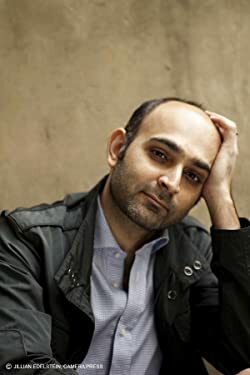 I would quickly run out of fingers counting the so-called genre writers who deploy its devices in cliched, non-innovative fashion – exactly the “sin” Hamid is accused of. And yet because such writers are “friendly” toward science fiction, or fantasy, or whatever, they are forgiven their ways… What is it about so-called literary writers using the “sacred devices” of science fiction or fantasy that causes the noses of many genre fans to turn up? Fiction is fiction. Its a big, open ocean for any writer to work with its devices as fits their literary vision regardless of the shelf it falls on in the bookstore. Who truly cares whether Hamid paid his “genre dues”? Should it affect how his work is critiqued? You have argued ‘yes’. I would argue not one whit.